Fire safety in the workplace can seem complicated, but we’re here to make it SIMPLE. Store stock safely: so keep corridors, stairs and exits clear to aid easier evacuation. The last thing you need is an obstacle course on your way to safety! Identify alarm points: make sure everyone knows where the fire alarm points are, so if necessary, people can raise the alarm quickly. Make sure doors are closed to stop fires from spreading. The picture below shows a common occurrence, a fire door being wedged open. Wedging a fire door will allow a fire to spread relentlessly throughout the building, damaging property and putting lives at risk. Place things that catch fire away from things that cause fire: things you use every day can turn into deadly materials when they come into contact with flames, so something as simple as keeping flammable items stored safely can reduce the risk and make a workplace safer. Let someone know if you spot fire safety problems: do you or your colleagues know who to speak to when you spot a fire hazard in the office? Ask your boss to speak to the responsible person, usually your employer or the building owner. Ensure everyone knows what to do if a fire alarm sounds: do your staff know where to go when the fire alarm sounds? Down the pub? Run for their lives? Making sure that everyone knows what to do when the alarm sounds can save lives in a real fire situation. What are the duties of a fire warden? Fire wardens play a vital role in a workplace’s fire safety plan. They make sure that everyone is prepared should an emergency occur. If you’re trapped in a fire, get behind a fire door and block the bottom of the door with a towel, sheets or clothing to prevent smoke getting through. Don’t go back into the building. There are lots ways to provide a safer environment at work. Common sense and easily accessible information are vital. Make sure there’s an evacuation plan in place, and undertake regular fire drills to ensure everyone knows what to do when the alarm sounds. Good ventilation and fresh air in a building improves productivity and helps people think more clearly. It also improves the health and wellbeing of employees. 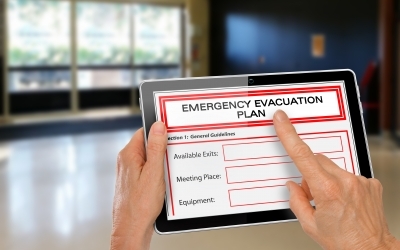 All businesses need an emergency plan to clearly explain the procedure to follow if a fire breaks out. Our seven-step guide explains what is required. Health and safety in the workplace is essential. Decrease the risks with the correct preventative measures — and common sense! Here’s what happens when it goes wrong.